Bushido: the Game is Copyright © GCT Studios. Microsoft Surface is Copyright © Microsoft. Welcome; and thank you for joining! The Bushido Companion project (un-official) is now in our Beta-pahse; our team of Bushido-enthusiasts are still busy playing Bushido, and we could use your help to improve the Companion project. Please sign-up for your FREE "Token(s)" account, and start playing Bushido: the Game, by GCT Studios. All updates up-to Wave 30, including Tetsuso from September 18th. Jung Pirates Updated to July 21st. Added the "Starter Set" and June 18th's "Yuji" for the "Jung Pirates". Completion of Waves 27 and all of Wave 28 added. The start of Wave 29 loaded. The beginning of Wave 27 has been added. Shadow Wind Clan renamed "Kage Kaze Zoku". All Kage Kaze Zoku models added up-to November 21st' "Yuto"
Characters up-to Wave 25 added. Characters from Wave 23 added. Tengu Descension starting roster added. Wave 22 characters already added and ready for launch. Re-designed Game menus allowing reference to all Traits, Actions, Specials and more. Tired and Exhausted status markers added to Warband menu. Added new characters, up-to and including Wave 21. Added marker for the "Held" state. The Savage Wave "Bakemono" type characters have a community Bakemono Ki Pool. Click/touch any card to view it full-screen. 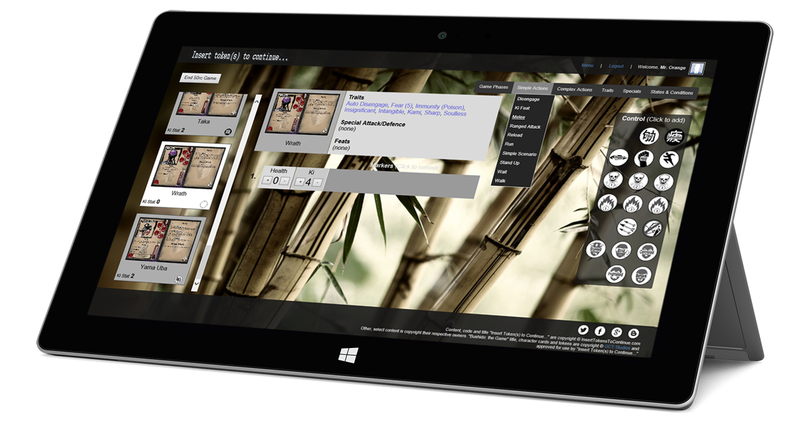 Designed to be used on any tablet, while playing Bushido: the Game by GCT Studios. Build and save many teams, from each faction. Keep track of each game you play. Quick, one-touch refreshers for traits, feats, actions and more. Easy to manage, one-touch marker add/remove. Other, select content is copyright their respective owners. "Bushido: the Game" title, character cards and tokens are copyright © GCT Studios and approved for use by "Insert Token(s) to Continue..."